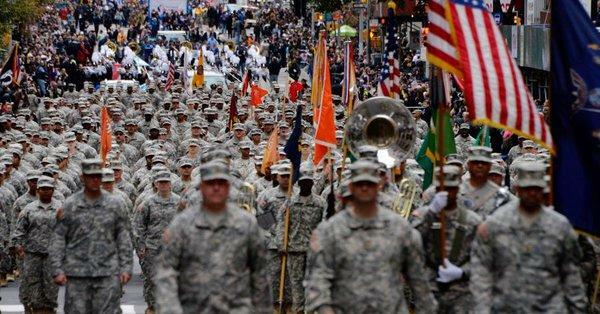 President Donald Trump has decided to cancel the D.C. military parade he’d always wanted citing the ridiculous cost pegged at $92 million, and blamed city politicians for “jacking up the price.” Trump’s own tweet confirmed the cancellation. The parade was earlier planned for Veterans Day. The President, however, still left open the possibility of holding the event, perhaps next year. Trump has also just opted to attend the Paris parade commemorating the end of World War I instead. He was invited last year to watch the French Bastille Day military parade leaving him impressed, which in part also inspired him to call for having an American one in Washington. He was even quoted as saying: “We're going to have to try and top it." Defense Secretary Jim Mattis, for his part, refused to comment on the mind-boggling $92 million estimate for the cost. He said: “I'm not dignifying that number ($92 million) with a reply. I would discount that, and anybody who said (that number), I'll almost guarantee you one thing: They probably said, 'I need to stay anonymous.' No kidding, because you look like an idiot. And No. 2, whoever wrote it needs to get better sources. I'll just leave it at that." The American Legion's commander will most likely welcome the new development as he said Thursday that, while the organization appreciated that Trump "wants to show in a dramatic fashion our nation’s support for our troops," it would be more optimal to spend the money on funding the Department of Veterans Affairs. The outrageous price quoted was meant to deter the celebration and support of our veterans. And we all know why. Its obvious they loathe our veterans. They loathe anyone who holds a position of protecting America. They want to abolish ICE, WHO ARE TAKING DOWN THE VILE PEDOPHILES AND TERRORISTS THEY STRIVE TO PROTECT. WHY WOULD THEY LET THE GUY TRAINING CHILDREN TO DO SCHOOL SHOOTINGS WALK??? They loathe everyone who is patriotic. THEY HATE AMERICA!! THEY WANT TO DESTROY AMERICA, OUR CHILDREN AND OUR FUTURE, SO THEY CAN FILL THEIR POWER HUNGRY, MONEYMONGERING GUTS!!!! THEY ARE OBSSESSIVE COMPULSIVE CONTROL FREAKS, WHO THINK THEY ARE ROYALTY AND PATRIOTS ARE TRASH!!! VOTE STRAIGHT RED TICKET AND RID OUR GOVERNMENT OF THIS CANCEROUS EVIL!!! THEY PROTECT THE CRIMINALS, ENDORSE DIVISION, AND STEAL YOUR HARD EARNED MONEY, AND SUPPORT THE CORPORATE AGENDA, THE DESTRUCTION OF US SOVEREIGNTY!!! THEY WANT TO MAKE YOU THEIR SLAVES!!! so yeah… they don't want a parade that celebrates Americans and their loved ones. Not hard to understand these sick leeches. RED WAVE!! PRAY, GOD BLESS AMERICA!!! BE SURE TO CHECK OUT THE NEW SATANIC STATUE IN LITTLE ROCK, ARKANSAS ON GOOGLE. ** THATS WHO AND WHAT THEY ARE!!! YOU BETTER BELIEVE THEY HATE YOU AND WANT TO DESTROY EVERYTHING WHICH IS GOOD. 34190 exactly right! One crazy idiot even destroyed a monument with the 10 commandments on it! These people are evil. Vote red! I can wait a little longer for that parade, the parade I desperately need to see is the anti American perp walk of all the corrupt people trying to overthrow our elected President. We can have the celebration parade after.